Here at Virtuous Bread we have always been interested in making baking easy and accessible. That is why our bread courses are so much fun and get such great reviews. People leave our classes with LOADS of bread that they made themselves and they realise that it was both enjoyable and simple! Our philosophy extends to sourdough bread too. The sourdough class is 8 hours long but don't let the put you off. It's a whole day because it takes so long for sourdough bread to rise! Most of the time you are kneading, cutting, shaping, laughing, eating, eating again, and yes, doing some "sourdough science". Click here and type "sourdough" into the search bar to find a sourdough class near you! Last year I was asked to write the "sourdough science" for a book entitled Homemade Sourdough. The original author let them down after submitting recipes so I stepped in and finished it off. It was published in May 2015 but there were some problems. 1. Although it is sold world wide, it is a US edition and the measurements do not translate to other types of measures accurately. 2. Some of the recipes don't work. Readers have graciously written to me over the past months pointing out some problems. In all cases I have tried to respond, but because the recipes are not mine, it's not been easy. I am delighted to write that the publisher has decided to re-issue the book (in a world wide edition) and has asked me to test all the recipes. So, this week is SOURDOUGH WEEK. It's also the coldest week of the year so far and we have no central heating! 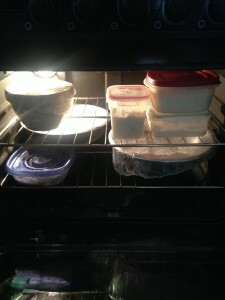 As a result, there are currently 10 bowls of dough refreshing in the oven with the oven light on. This is just enough heat to make a cozy environment for sourdough to refresh. That's a top tip, by the way. Bowls of sourdough refreshing in the oven with the light on! So, watch this space and as I find impossible recipes and turn them into workable things of simple beauty, I will let you know! Meanwhile, if you are excited, come and take a bread class with us and get a march on your new year's resolution to bake your own bread. Happy New Year to all - may it be full of challenges you overcome with grace and joy.